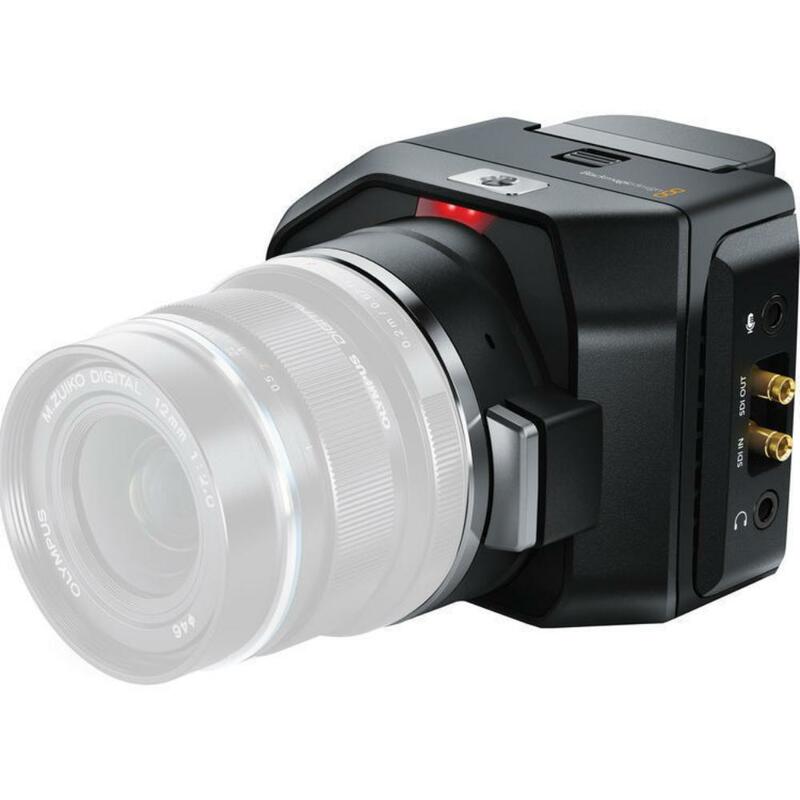 The Blackmagic Micro 4K Studio Camera is an ultra-small camera designed specifically for live production shooting. Shoot 3840x2160p up to 30 FPS or 1080p up to 60 FPS on an Ultra HD sensor with built-in color correction. Its size allows it to be mounted in inconspicuous spaces - perfect for stage events. Even though it is small, it still sports a full-size HDMI connector for adding a monitor to your setup. The camera comes with built-in microphones but you can also connect an external mic. The camera also comes with a standard AC adapter but you can also get over an hour of run time on an optional LP-E6 battery. A built-in row of buttons at the front of the camera makes operation intuitive and 1/4"-20 mounting threads are on the top and bottom for easy connection to a variety of peripherals. The Blackmagic Micro 4K Studio Camera is ideal for concert shooting, events, ceremonies, documentary work, and for shooting in very tight spaces. This camera is a bare-bones system that is essentially a sensor only. All the peripherals need to be added on or rental separately. Please see the Notes tab for more information about this. • This camera does not record internally. This is the 4K studio version that sends a feed to an external recorder over SDI, such as the ATOMOS Shogun (rentable separately). If you need internal recording, see the Blackmagic Micro Cinema Camera. • Camera display information is sent over HDMI and not SDI. An HDMI-capable external monitor, such as the ATOMOS Ninja Assassin (rentable separately) would be needed for settings live feed. • This camera is a bare-bones system that is essentially a sensor only. All the peripherals need to be added on or rental separately. • Accepts LP-E6N batteries. 1 is included. Renting spares is suggested.